Split paddles break down into multiple pieces to reduce the overal length for storage and transport. This is particually useful if you have an inflatable canoe or intend to travel with your WW kayak on planes. 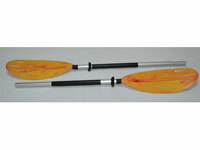 Split paddles are also recommended as emergancy spares for touring, sea kayaking and white water paddling. Sea Kayaks & Touring Kayaks often have deck bungees on the rear deck specifically for storing a set of split paddles. 4 part kayak paddle perfect to fit in your kayak as a spare. Drybag Included. 2 part split versions of our popular Day Tour paddle by Feelfree. All the Werner touring paddles come in 2 parts with an adjustable ferrule. High Quality 4 piece Powerhouse with Glass Blades. High Quality 4 piece Sherpa with Glass Blades.